Israel Leavitt branch. 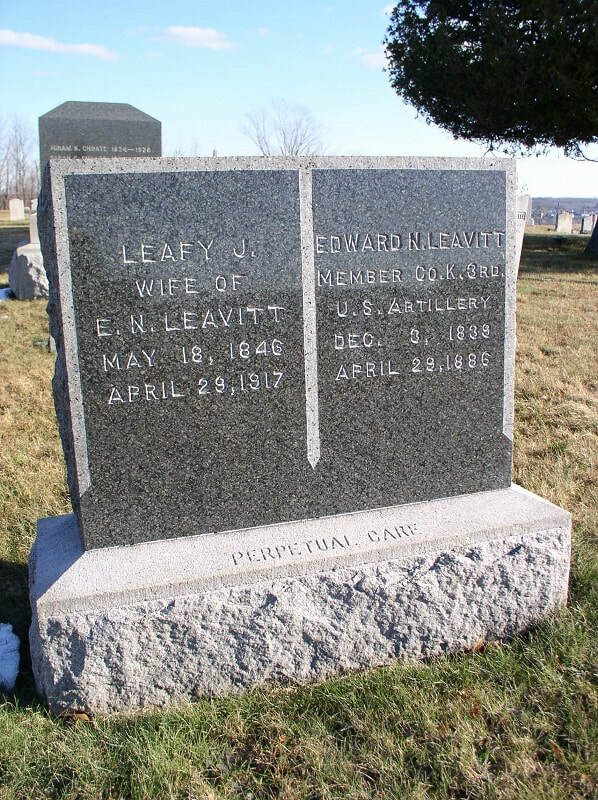 Lincoln Leavitt 1820-1888; Mary H [Huntington] his wife 1813-1894; Alvin 1845-1851; Elizabeth E 1843-1916. OAK GROVE CEMETERY, huge old one in town off Brunswick Road, adjoining Catholic cemetery. Israel Leavitt line. 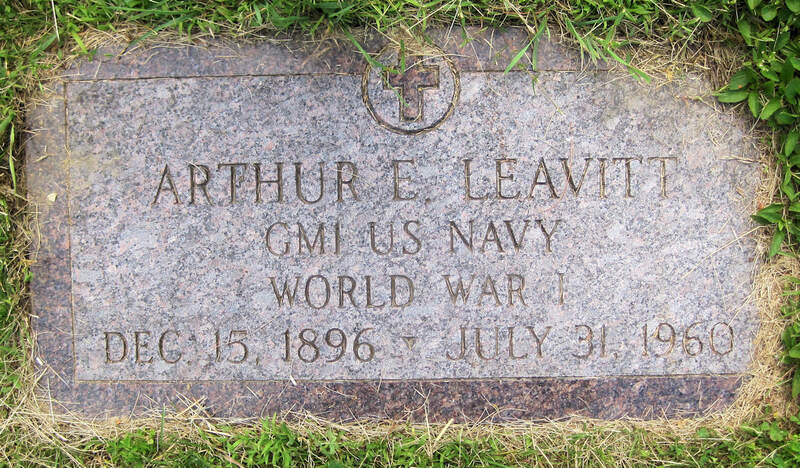 Arthur E Leavitt Dec 15, 1896 - July 31, 1960; his wife S Marjorie Townes July 9, 1903 - Feb 28, 1997. ABOVE: 1. Leavitt Lot. 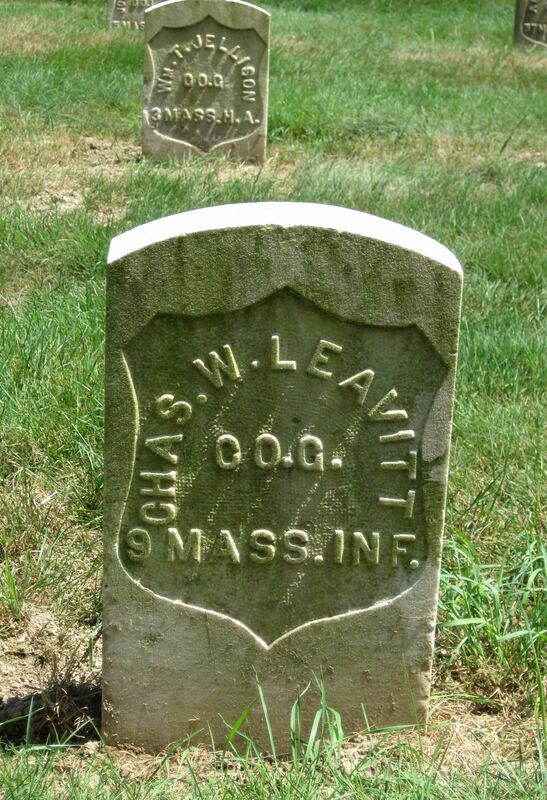 James A Leavitt is not buried here. 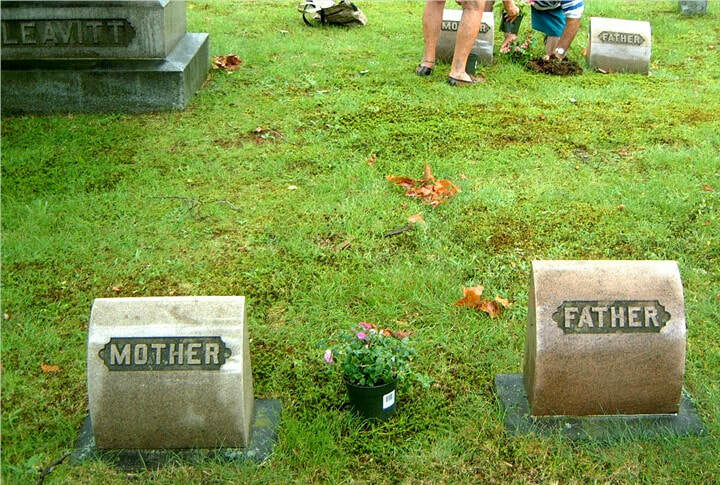 Arthur and mother Teenie. Not sure who this James is. The monument in the right rear next to the tree is the Leavitt monument of Roland Rhoades' family, below. 2. 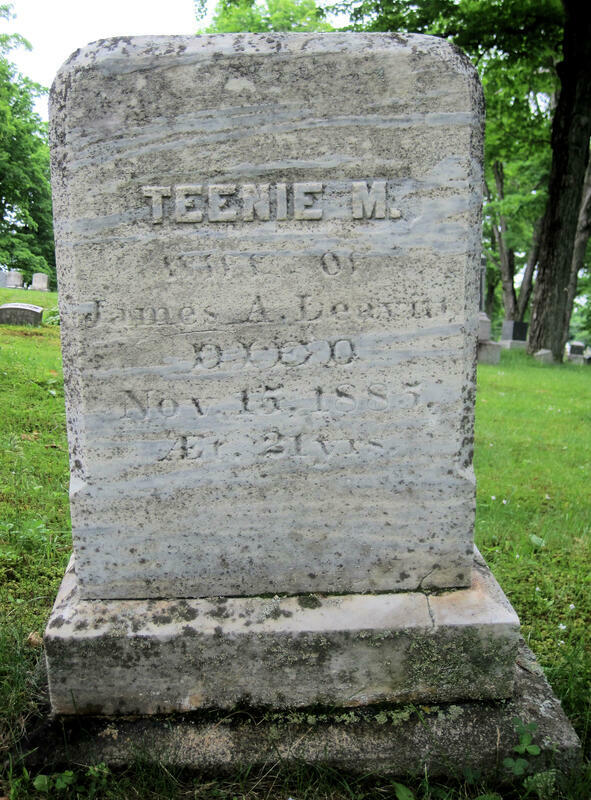 Teenie M Leavitt, wife of James A Leavitt, Died Nov 15, 1885, AEt 21 yrs. 3. 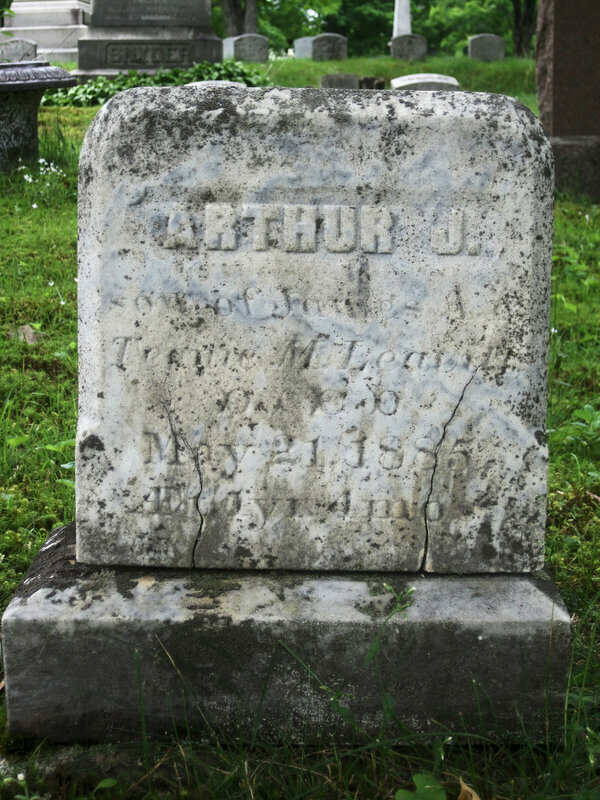 Arthur J Leavitt, son of James A & Teenie M Leavitt, Died May 21, 1885, AEt [looks like 0 yr] 4 mo. 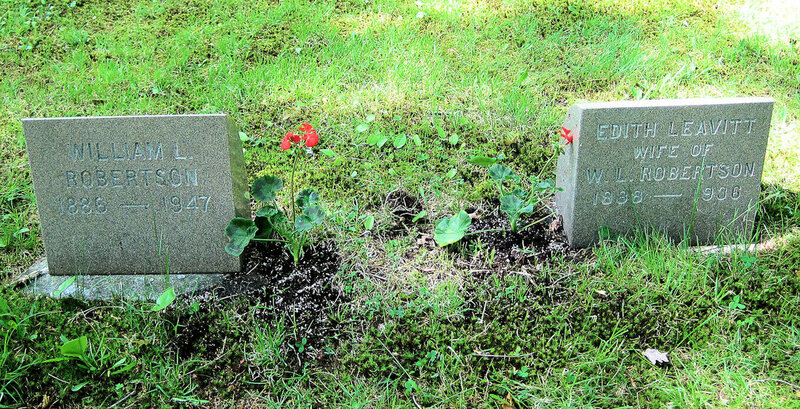 BELOW: Leavitt Family Lot of Roland Rhoades' grandparents and great grandparents. Lot 548 on Crescent Ave. Engravings updated about 2005. 1. 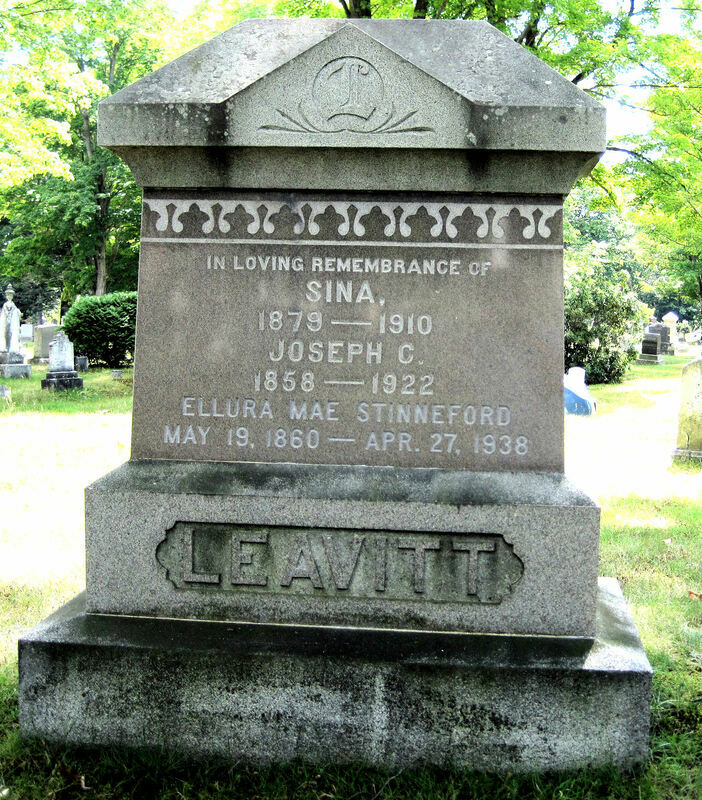 In Loving Memory of Sina 1879-1910 [dau of]; Joseph C Leavitt 1858 - 1922; Ellura Mae Stinneford May 19, 1860 - Apr 27, 1938. 2. 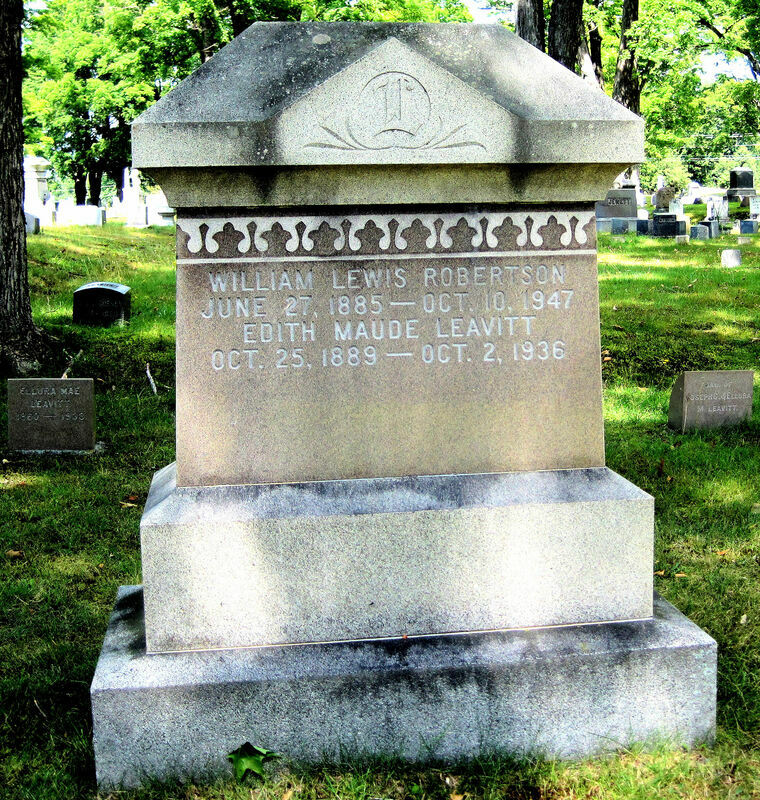 William Lewis Robertson June 27, 1885 - Oct 10, 1947; wife Edith Maude Leavitt Oct 25, 1889 - Oct 2, 1936. 3. 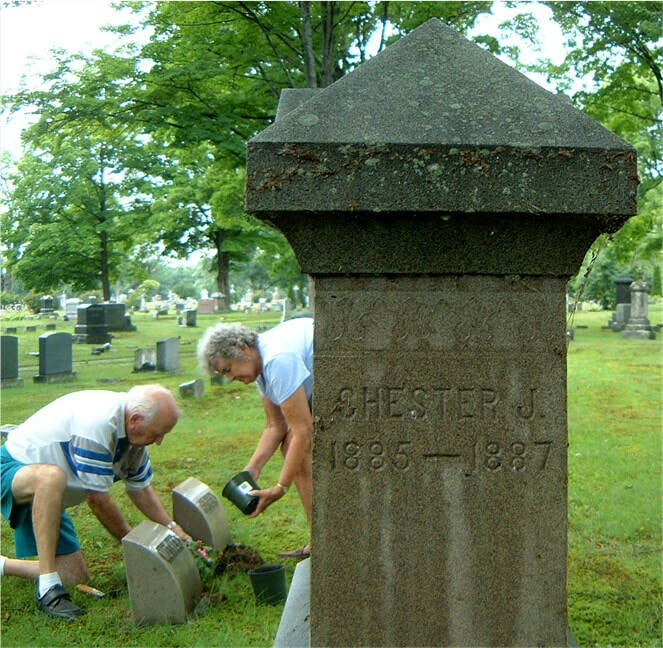 Side of the monument with Chester Joseph 1885-1887. 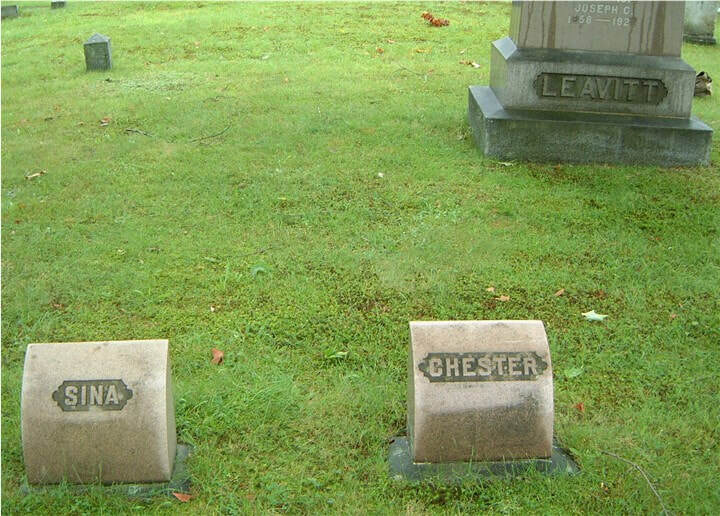 PGC records say Chester was re-interred there from the Cambridge cemetery and the dates may be wrong. In the background are my parents planting geraniums on her parents' graves in 2002. 4 & 5. 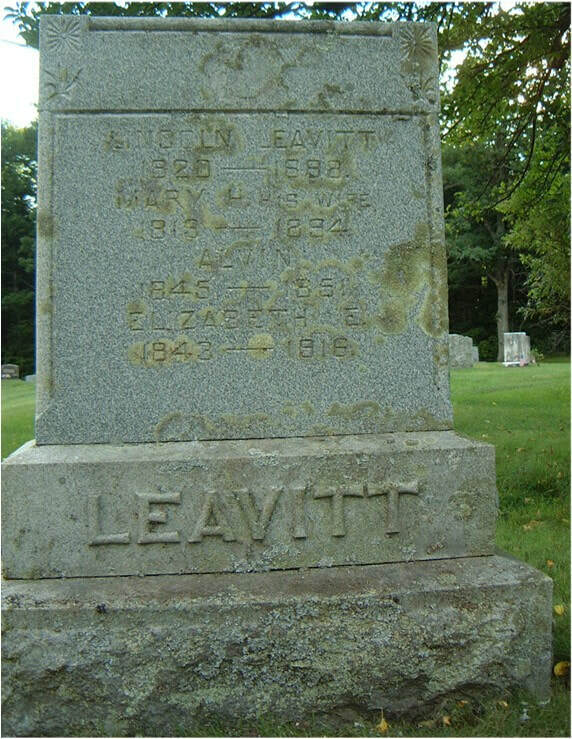 Front and back of stones for Joseph C Leavitt (my great-grandfather, born Nov 15, 1858 in Cambridge Maine to Ralph C Leavitt (1828-1894 buried in Cambridge, son of Joseph Leavitt born 1782) & Mary Abigail Morgridge. And his wife Ellura Mae Stinneford. ​6 & 7. Front and back of the stones for children Chester and Sina. 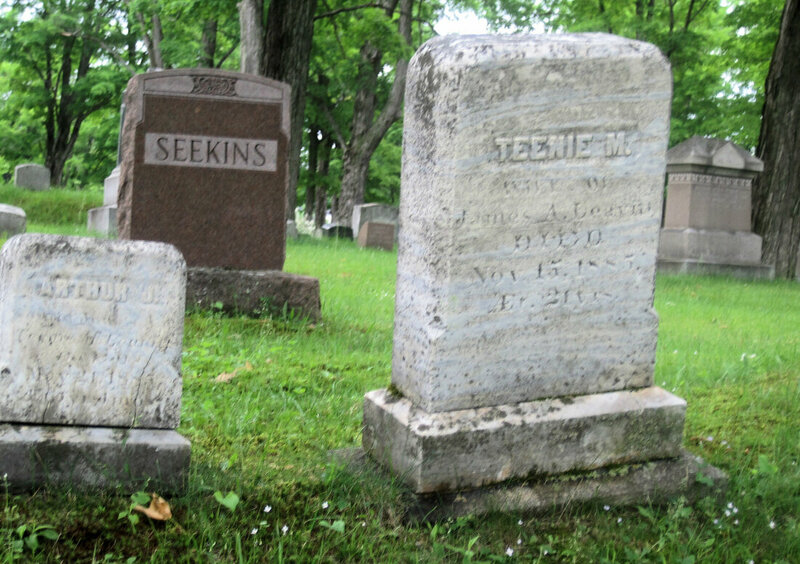 Sina Ellen died of typhoid in 1910. ​9. 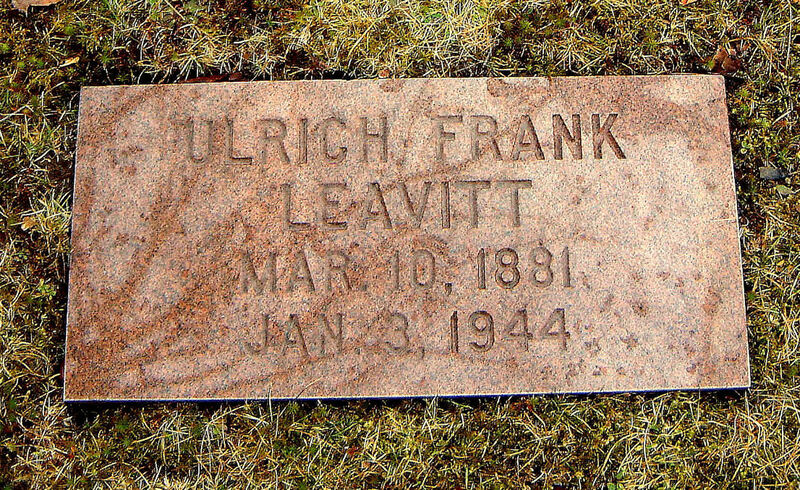 Ulrich Frank Leavitt, March 10, 1881 - Jan 3, 1944, son of Joseph C & Ellura. 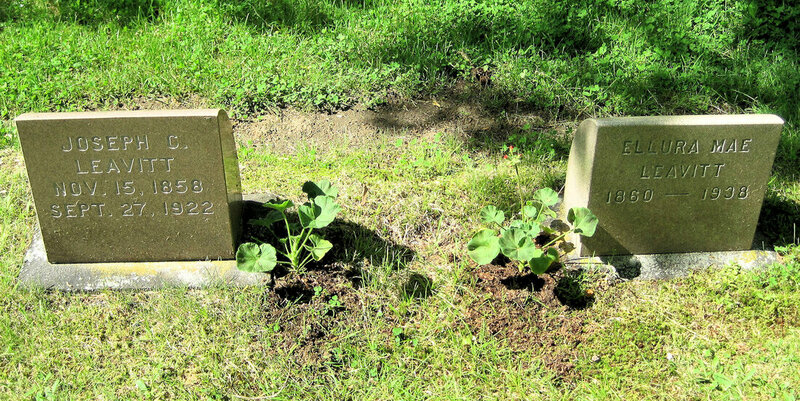 We were surprised to learn from PGC records that he was buried there without a stone, so we added one.